Travel through exotic cities with The Backpackers Holiday Club, a programme that follows stories from the Gospel of Matthew. This fantastic new resource from Scripture Union has everything you need to host the best holiday club in town! With a travel theme, there's plenty of exploring, brand new fun and games, crafting, making and more, as the children journey through European cities. The Backpackers daily programme focuses on awesome accounts from the Gospel of Matthew, introducing the love of God, as seen on the cross, and inviting children to encounter and respond to God's plan of salvation. 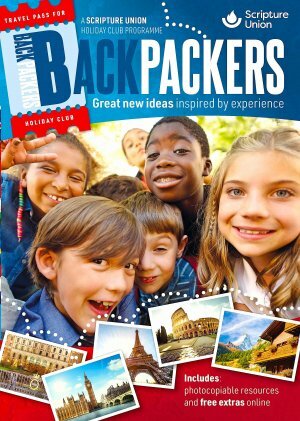 The Backpackers Holiday Club by Alex Taylor was published by Scripture Union in October 2018 and is our 659th best seller. The ISBN for The Backpackers Holiday Club is 9781785067242. Be the first to review The Backpackers Holiday Club! Got a question? No problem! Just click here to ask us about The Backpackers Holiday Club. Please could you tell me which bible stories are covered in Backpackers? A:this Holiday Club explores the events of Jesus' last week on earth - helping them to understand his Journey to death and His resurrection.